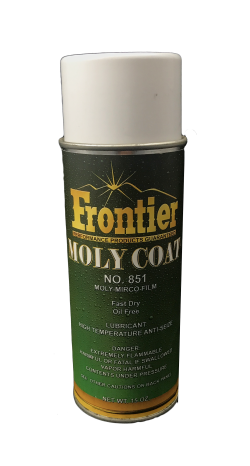 Moly Coat is an extremely versatile spray lubricant developed to provide a tough durable lubricating film and anti-friction barrier. Moly Coat has an affinity to metal surfaces and a broad temperature range (-110 Degrees to 1050 degrees.) This product withstands high temperatures without losing its lubricating abilities. 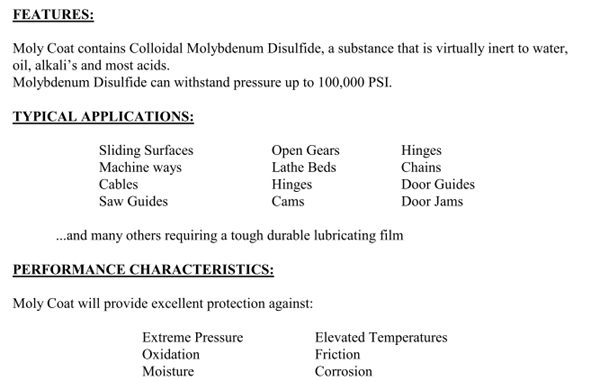 Moly Coat is designed for applications needing a durable non-oil lubrication barrier that will provide superior rust and corrosion protection without leaving an oily film. Moly Coat contains Colloidal Molybdenum Disulfide, a substance that is virtually inert to water, oil, alkali’s and most acids.